I’m calling this a preview because this is not a final photo. I have not finished out the back or framed it, and it needs a final cleaning. I took the phot in my studio and the lighting is uneven. It is rather large and I will need to try to get better photos outside. Unfortunately, our weather has been pretty drippy and dreary of late and it is raining as I write this. It is, however, supposed to be sunny for the next couple of days. I started this mosaic last March (it was formerly titled Self Portrait № 2) but got distracted with a commission and then a couple of voluntary mosaic detours. I got back to work on this in September and have worked earnestly to complete it since then. It has been quite a process and a journey as well. This mosaic became more and more personal and tormenting to me as I progressed. I suppose that makes sense. It was rather odd to me that the work became more and more strenuous until, in the final weeks, I was overwhelmed with how technically difficult it was: the sheer labor of it was walloping me. It was technically difficult from the beginning. Creating the curves against empty space, and also the embedded rings defined by empty space, while maintaining the horizontal and vertical grid-like field, was extremely challenging. But it was only as the work became more personal, and shifted in concept from wounds to familial wounds, that it became more and more physically challenging. At the same time, I have been trying to work more loosely and leave my perfectionism behind, in hopes of exploring artistic vision over technical mastery. I chose not to use a grinder and relied on hand tools only. There is nothing wrong with a grinder, but I find it encourages my obsessive perfectionism. And obsessive perfectionism is really miserable. I’ll write more about it as I post final photos. Lovely day in the studio yesterday: mosaicking and listening to 70s music, with the chimes and nature sounds coming in through the screen door, along with fresh air! I'm working with the darkest browns and reds, although I am surprised at how light they look in this photo. Lighting! I have not done a work in predominantly smalti in years. I am enjoying its incredibly unique reflective quality. Self Portrait № 2, in progress. 27" x 36" | 69cm x 91cm. Smalti, mosaic gold, porcelain. I am really jazzed about this new project! 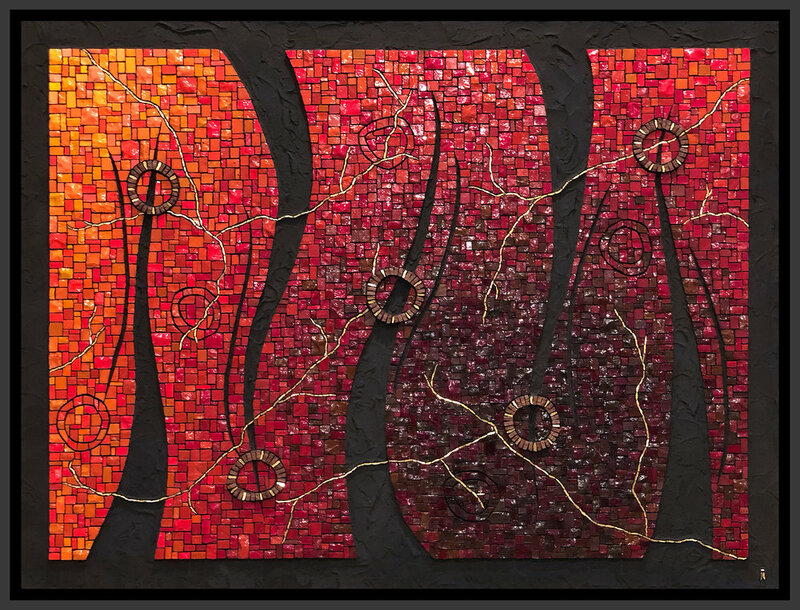 I've only done decorative pieces and a few very small mosaics in the last 3 years, as far as new work is concerned. Although I did finish two very old, unfinished works, both of good size, this will be the first large work in some time. It will probably be months in the making but I'll post pics of it from time to time. I'm only just getting started after spending a good amount of time on the design and in preparation, including the little value study that I did. In this photo, I'm working on 5 chunky rings. They are circular, yes, but not perfect circles. In fact, I used some bones—cow bones, I think—that my husband got for our dog Lucy. She loved them, of course, but she broke a tooth on them and had to have some major dental surgery. No more bones for Lucy. Being the scavenger that I am, I collected the bones for some future purpose. They have at least two more lives, as the model for the rings in this mosaic, and also as specimens in a future mosaic. An exercise: 7" x 5" | 18cm x 13cm. Italian, Mexican, and Chinese smalti. 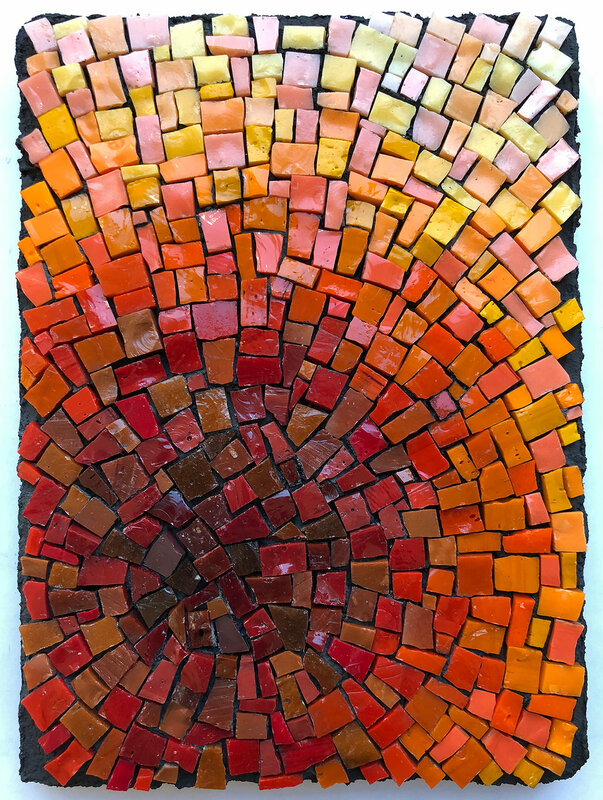 This is a little exercise I did in preparation for my next mosaic, which will be much larger at 27" x 36" | 69cm x 91cm. As you can see, I've used quite a range of values in different shades of browns and reds. I had intended to go a value lighter, but realized that I did not want it that light for this upcoming work. I'm not even sure that I want to go as light as I did in this little exercise. I never feel like I am very good at this, but I feel compelled to keep doing it. I take photos along the way, converting to black and white which is very useful. I was not focusing much on technique here, just shading. After I got started, I decided to try to also work in a circular pattern, although I won't be using such andamento in the larger work. This exercise was very helpful. It helped me to eliminate lighter brown shades, and to better define the range of values that I want to use in my next work. I can see that I'll need to expand the medium-light values to develop that mid-range more fully.